Further reaffirming my modest proposal that the rich should be harvested for their succulent nutrients, here's a dispatch from Raphael Orlove, a Man of the People, and his discovery of an Airbnb contained entirely within the confines of a $118,000 electric car. "How often do you get to sleep in a $118,000 Electric Car [sic]?" asks our thumb-shaped douchehole, also known as Steve. I don't know, Steve! Let's break that down! How often have I slept in $118,000 worth of car? None. (Must be rich!) How often have I slept in an electric car? Nearly once. How often have I slept in a car? Three times. How much do I want to sleep in some guy's $118,000 electric car? Only if I can assume (and rightfully so) that the center console can be used as a camp latrine. 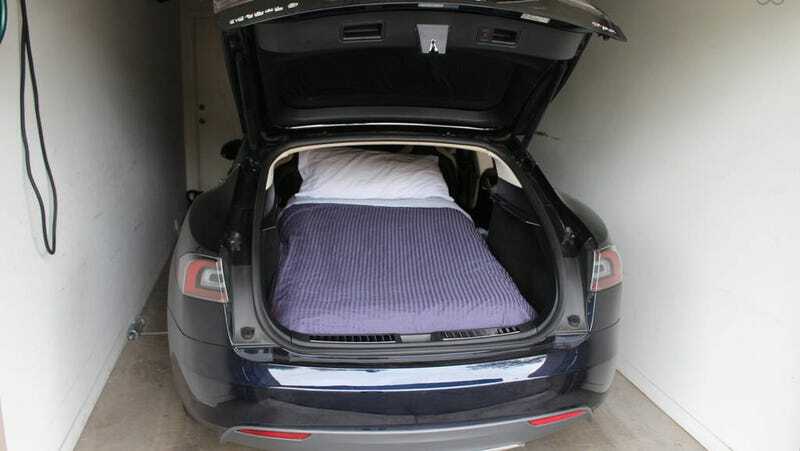 The Tesla will be your private sleeping space that is securely parked in my garage. You will also get access to the Kitchen, Living Room, TV, and Private Bathroom & Shower in the Condo. Wait, can we just sleep in the condo then? You can set the mood with your selection of any Internet music you would like on the huge 17" monitor. Mile Low Club, here we come! A better question would be: "ever make love in someone else's $118,000 Electric Car [sic]?" Also, I had no idea you could retrieve music from the Internets. **Sorry, NO NBA Players allowed. Despite my love for basketball, the Tesla is just too small for anyone over 6' 6". Please...stop asking. Seriously, LeBron keeps blowing up my phone. So annoying. As the Tesla is of course my transportation, I would request that you are up by 8am so I can get to work. What if you drive away while we're sleeping in the back? It is quiet and electric, after all. Hilarious shenanigans would ensue. Get me Chevy Chase on the line. We're bringing back National Lampoon! Or! For an extra $100, can we come to work with you? (Seeing as you're hard-up for cash anyway.) You know, we'd sit at your desk, make farting sounds into the telephone. Maybe collate some files or whatever it is you people with employment do. Might as well get the full white-collar experience! You need a car to get around...but seeing that you are staying in a Tesla, we can arrange for me to drive you around for an extra fee, as I'm a commercially insured Limo driver. So generous. By day, he is Commercially Insured Limo Driver Man. By night, he is Tesla Hotel Airbnb Man. Truly a man who wears many hats. Steve, who wants you to well and fully know that he lives in Phoenix "but bought my Cabin in Flagstaff to have a great get-a-way from the summer heat," is actually Mister Musks' best PR man, and he is spreading the Tesla gospel in the most insufferable manner possible. You see, he's giving the world a chance to experience his car! (As long as you're not LeBron.) How charitable! How generous! It's "The Fastest Hotel In The World," at least for now until I start letting people take naps inside my Thrust SSC, which is not yet a euphemism. For $85 a night you can sleep in Steve's Wealthy Person Plaything known as the Tesla Model S. For a mere $20, however, he will roll down the window and you can stick your lice-infested Pigpen head inside to smell the rich, supple Dockers-kissed leather seats. For an additional $35 you can rub your grubby, poor person's pawprint over the Tesla's smooth flanks. Afterwards, you must pay for a bottle of Clorox to wipe away your filthy, stinking germs. And for "an extra fee," Steve will drive you back to Sky Harbor Airport, joyful memories of Phoenix in your mind, and wishing you could be back to the Valley of the Sun already. It's the P85 model, too. Don't ask him why he didn't spring for the P85D.